It will soon be possible to do New York as a daytrip. But would you want to? This summer, Aer Lingus plans to reintroduce its 7.50am departure from Dublin to JFK. The flight arrives at 10.20am EST - "in time for guests to enjoy brunch downtown," the airline enthuses. In theory, the June 9 to August 31 service can be combined with 17.30EST or 21.00EST return flights from JFK to Dublin, bringing you back in 24 hours. Of course, there's more than a hint of marketing to all this - but the theoretical 24-hour turnaround says a lot about the growth of transatlantic travel. In 2016, Aer Lingus alone is launching new routes to Los Angeles, Newark and Hartford, Connecticut, as well as adding capacity to its Washington DC, Chicago and New York services. Its summer sale fares start at €255 each way. The airline's transatlantic passenger numbers have grown by 62pc since 2010, and with IAG's considerable wind beneath its wings, it's only getting started. Transatlantic works in both directions, too. One in 10 North American arrivals to Europe now come through Ireland, according to Tourism Ireland - boosting tourism numbers and growing Dublin Airport's status as a hub with pre-clearance facilities. Capacity is growing from Shannon too, and Cork gets its first scheduled flights to North America, courtesy of a Norwegian route to Boston, this May. Downsides? NYC is never cheap. But what a difference a day could make! Dreamy as a day-trip may sound, travellers can score added value with package holidays. American Sky (americansky.ie) has flights plus three nights at the Fitzpatrick Grand Central Hotel (above) from €699pp departing this month, for exmple. Cassidy Travel (cassidytravel.ie) has flights via London plus seven nights' three-star accommodation from €823pp in November. It's also worth noting that January, February and March are the cheapest months to visit the Big Apple - with fewer crowds, lower hotel rates and promotions like Restaurant Week (Jan 18-Feb 5; nycgo.com/unlock). What's new in New York? Rather than a 24-hour smash-and-grab, why not extend your stay in New York, or combine it with a cruise? 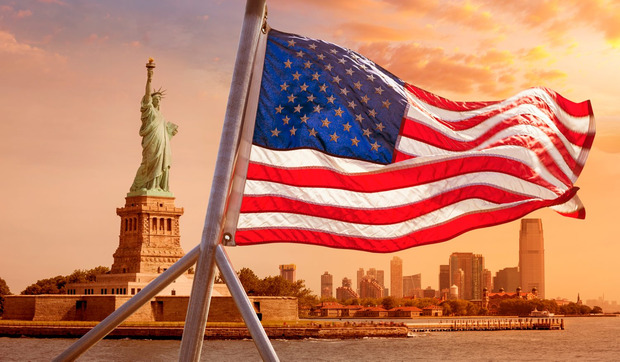 American Holidays (americanholidays.com) has flights plus three nights at the four-star Sheraton New York Times Square Hotel, followed by seven nights on a Bahamas cruise with Norwegian from €1,469pp, departing in March. The package (REF: 1007213, subject to availability, comes with $100 on-board credit or a 250-minute internet package, among other options. NB: Prices subject to availability.